A black and white photograph of the Dafoe family. 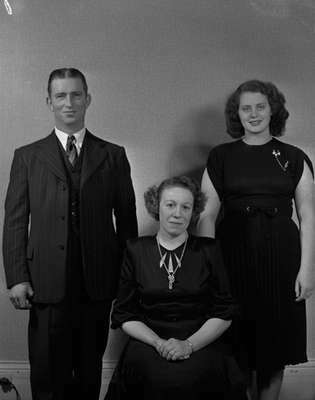 James Howard Dafoe is standing on the left of his wife Evelyn Peggy Benn Dafoe and their daughter June is standing on the right of the photograph. Dafoe Family, 1947, Marjorie Ruddy. Whitby Archives A2013_040_1112.